Tax preparation is the process of preparing tax returns, often income tax returns, often for a person other than the taxpayer, and generally for compensation. Tax preparation may be done by the taxpayer with or without the help of tax preparation software and online services. Tax preparation may also be done by a licensed professional such as an attorney, certified public accountant or enrolled agent, or by a licensed tax preparation business. Because United States income tax laws are considered to be complicated, many taxpayers seek outside assistance with taxes. We are here to help you, preparing income tax returns since 1999. The best compliment we can ever get is a referral. 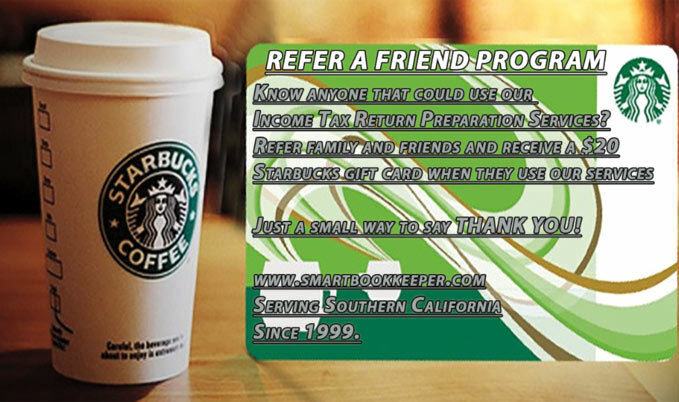 Earn a $20 Starbucks gift card for each client you refer that signs up with us and uses our services. Just a small way to say THANK YOU for your continuing support and loyalty.